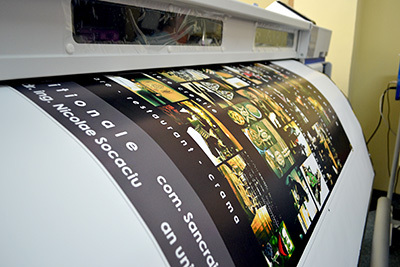 Poster printing, Fast and low-cost, Overnight, Next Bussiness Day, Everywhere in Europe! Eco-Friendly Ink, Epson machines and Epson original ink used in the process. Free Full bleed cutting! The posters that we print are guaranteed to last up to 3 years and beyond in natural light without any type of lamination needed whatsoever. The poster is UV-Resistant, but that’s not the only thing it has. It is also waterproof. Yes! It’s not a problem if it rains on the poster, of you spill some water on it. The colors are going to stay there. The quality of the posters is considerably high. To achieve this, we use high-performance Epson printing machines with real original GS2 ink. All our printing equipment has been thoroughly ICC-Calibrated in order to obtain consistent and powerful colors all the time, through every print of every customer. To get a good poster, it’s not enough to have the printer. You also need a good material…and we’ve got a great one! We use a 200g thick Poster Paper that makes the colors stand out, while being visible from any angle (no excess gloss). The details and text are clear and sharp, while the colors maintain vividness. Many of the cheap poster prints that you find on the market are printed by laser technology. Laser is good for small prints, but not large ones. To put it in a nutshell, they’re not very good. There’s lots of explaining to do here but we won’t go into detail. We use real Ink in our posters. Ink has always been the choice for posters, photographies, banners and any kind of signage. Note: Prices exclude VAT. You will NOT have to pay VAT because of intra-EU commerce laws.